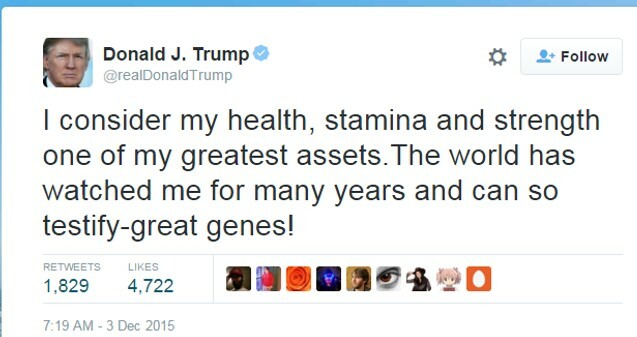 Trump-ed Up Genes – Patrick F. Clarkin, Ph.D. I try to keep my ears open to how public figures speak about science and anthropology. It’s always interesting to learn how different people, particularly influential people, perceive these subjects. For example, in his 2009 acceptance speech for the Nobel Peace Prize Barack Obama said that “War, in one form or another, appeared with the first man.” That’s an empirical claim, but I don’t think the archaeological evidence is on his side. However, Obama’s statement offered a tantalizing window into the way he might see war – that it is simply an unavoidable outcome of human nature, implying that we may be stuck with it indefinitely. I don’t know for a fact that he actually thought that way; that’s me trying to read between the lines. And I’m not saying that such a view is wrong; I don’t think war will be eradicated anytime soon either. But I don’t think we should reduce something as complex as the large-scale arming and mobilization of military forces simply to some fuzzy notion of an aggressive human nature. I’ve written before about genetic determinism and the problematic view that organisms are “hard-wired” to look or behave in a given way. In fact, this was one of the most popular posts on this site (see Developmental Plasticity and the Hard-Wired Problem). Of course genes matter, but they also go hand-in-hand with the nurture side of things. I’m trying to be fair. Most people probably think that they are better than average in some way, though our egos probably prefer the illusion of our superiority to an actually measured estimation. And, our particular favorite ‘superior’ trait probably varies person to person. Better than average in what? Intelligence? Artistic ability? Height? Beauty? Kindness? Athleticism? Smashing things with your head? We all have our niche. Since the Trump family likes the analogy of race horses, then presumably the trait they have in mind is being able to run some race towards ‘success,’ which – I’m guessing – they likely define as success in business or accumulating wealth. If that’s the case, then they might think that those who aren’t fast enough, because they lack the right racehorse genes, deserve to be left behind. Of course, the problem is that it’s rather easy for someone standing at the top of the hill to attribute their position to winning the genetic lottery. We probably all crave an explanation for why we sit where we do (“Wherever you go, there you are”). Surely, it’s more complicated than any single cause, and genes are one factor among many. For example, if genes were everything, then we wouldn’t see life expectancy improve so dramatically in several countries. Nor would we see populations become taller as health and nutrition conditions improve, etc. “the argument went that social stratification in America was caused by innate intellectual differences, and consequently that government programs designed to assist the socially disadvantaged and to ameliorate economic inequality were useless and doomed to failure. This entry was posted in Genetics, Nature and nurture, Uncategorized. Bookmark the permalink. For somebody running for election by democracy to the US presidency to make out the case for inherited leadership (kingdoms) is, to say the least, bizarre.